(Tiger Swallowtail (Papilio glaucas) - 01) This is a male tiger swallowtail butterfly evidenced by its bright yellow wings with four black tiger stripes on each wing and a black border. 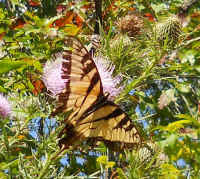 Females are either yellow or black in color, with bluish spots on the trailing edge of the wings. (Tiger Swallowtail (Papilio glaucas) - 02) The wing span of this eastern tiger swallowtail ranges from a little over 3 inches to 5.5 inches. 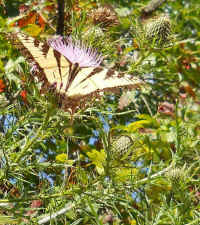 Tiger swallowtails are strong flyers. (Tiger Swallowtail (Papilio glaucas) - 03) This eastern tiger swallowtail shows a lot of wear and tear, particularly on the trailing edge of both wings and tail. 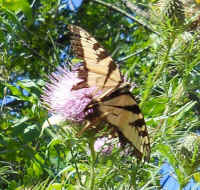 It is seen here feeding on the flowers of a tall thistle. (Tiger Swallowtail (Papilio glaucas) - 04) In this side view of the eastern tiger swallowtail butterfly, we can clearly see his body. 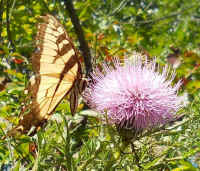 Tiger swallowtails are considered to be one of the most common of all butterflies.